If you’re not familiar with it, Whitecoat is one of the many online directories listing healthcare professionals, and amongst other things allows people to leave review of you as a practitioner. Similar ones include Health Engine and MyHealth1st. Be careful how you use them. As I’m a practicing healthcare practitioner, I received an email from Whitecoat advertising their online booking service today. They were offering online booking for less than $2 a week. On the surface of it, it sounds like a good deal. I’m going to put my marketing hat on and look a little deeper. Before we go any further though, in the interests of full disclosure, we do provide practice management software with full online booking including cluster and block booking. Hence I may be biased, but the points we’re going to cover are valid none-the-less. The primary issue with most of these sites is loss of control. 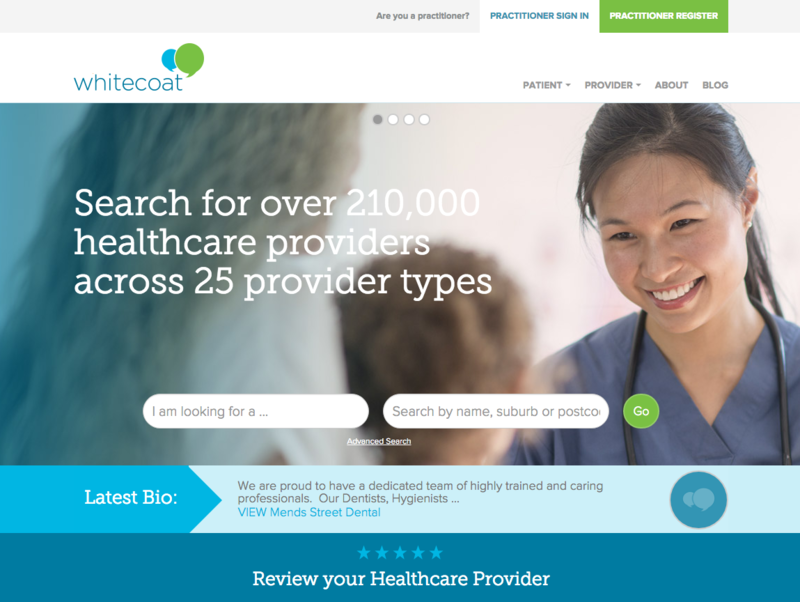 Going to Whitecoat’s homepage, you’re presented with an initial headline offering “Search for over 210,000 healthcare providers across 25 provider types”. It also offers to let you “Read over 250,000 reviews and compare healthcare providers”.Straight away you’re competing on this site with all the other practitioners in the same profession and all the other professions dealing with similar conditions. Straight away you’re competing on this site with all the other practitioners in the same profession and all the other professions dealing with similar conditions. You’re also battling against reviews. As it’s illegal to solicit reviews in Australia as a healthcare practitioner, you’ll be fighting against the fact people who have had a bad experience are more likely to leave a review than someone whose had a positive experience, as well as other practitioners who may be flouting the law by allowing or even encouraging reviews on their profile. I’m not convinced that these portals are as popular as they claim to be. The stats in the Whitecoat email sent to me claim that there was 949 searches on Whitecoat for a chiropractor in May 2017. That may sound like a lot, but according to Google’s Keyword Tool there was on average 27,100 searches per month for the term chiropractor in Australia. In comparison 949 is rather pathetic. So it would seem that people aren’t even really searching on these directories. To me that would make sense, as most of the time unless people are actively looking for reviews, using one of these sites just adds a layer of redundancy to their search. 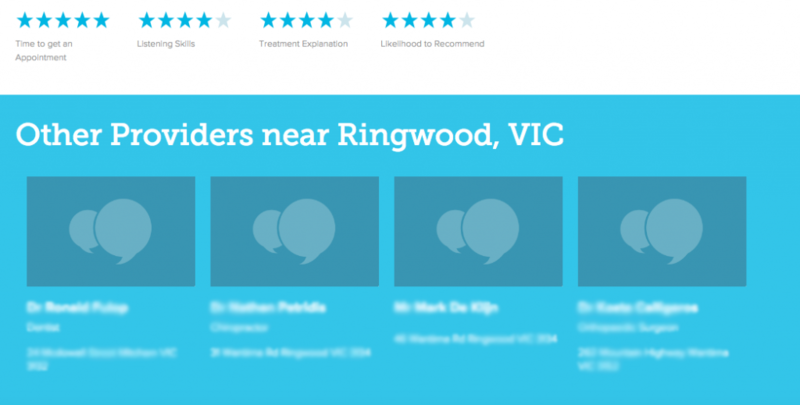 For example, if I’m looking for a chiropractor in my area, I’m going to search for “chiropractor Ringwood” in Google and use one of the results. I’m unlikely to search for Whitecoat then do another search for my area, and navigate through their site to find the practitioner I want. It just doesn’t make sense. It’s far quicker and easier to search in Google. Even if people do go to Whitecoat and do a search, it’s not obvious what criteria are used to rank the results they deliver. I imagine that practitioners that have a paid listing will get priority. Apart from that I can’t determine what their algorithm is for ranking results. It doesn’t appear to be the number or quality of reviews. Unlike Google where you can improve your search engine rankings and hence get more exposure, there seems to be nothing you can do except solicit more reviews, which isn’t allowed by law. Lastly, the biggest reason why you would never want to make this site your primary online booking portal is this. On your profile page the site actively encourages users to visit the profiles of other practitioners. You’re leaking your hard won visitors to your competition! So should you use Whitecoat? Here’s my recommendations. Most practitioners have a listing by default if you’re a registered provider with the health insurance company NIB. That should include any practitioner with a Medicare Provider number. Make sure you claim that listing, update the address and other details to match the details on your main website. If possible add a link to your website for SEO purposes. If you’ve claimed your listing you should turn off reviews. It’s possible to do on Whitecoat, and as you now control the profile I would expect that you’re obliged to turn off reviews under National Law. If your budget allows, take up a paid listing, but redirect the booking engine to your main website or directly to the online booking provided by your clinic software. Don’t use the Whitecoat site if possible, and certainly don’t direct traffic there from your website as you don’t want the visitor leaking away to your competitioners. If you’d like access to online booking that you control that offers cluster and block booking, consider our iconpractice software. Access a 30 day free trial here. All trademarks, designs and images of whitecoat.com.au are the property of Whitecoat. Used for the purposes of review. Great article and just shows how clueless those behind Whitecoat are. Whitecoat is a joke and as good as useless. White elephant more like it. I believe the health fund NIB owns Whitecoat. Are CBHS and NIB linked? David, I totally agree. I am outraged that my personal details (name, contact details, practitioner) are being forwarded from CBHS to Whitecoat. I thought this was illegal as the details are being used for a purpose not related to the agreed collection. I don’t have a relationship with Whitecoat and do not want one. Who knows where my data will end up? Will I become a marketing target of similar practitioners? Time to check the Australian Privacy Principles. David – excellent point! Your search on whitecoat alone provides whitecoat with more info than CBHS has admitted to. Dr Matt – good question. We believe not, surely not, but who’s to say they’re not in talks we haven’t been made aware of yet? And surely your own doctor is the best source of a referral? What a joke that doctors can turn off the Reviews, they can pick and choose what they want patients to see. Hi Laura, I see where you’re coming from. Thing is under national law doctors aren’t allowed to use testimonials in advertising and a review is considered a testimonial. So if they’re able they should actually turn them off.